The image of the nation as a great ox being slowly roasted for consumption by members of the government is one which appears to have occupied James Gillray’s mind on a number of occasions during the mid-1800s. 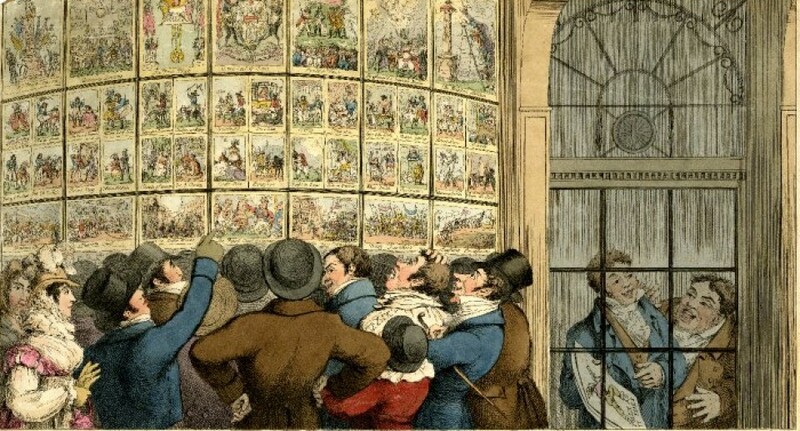 However despite the fact that he made no less than three preparatory drawings for a caricature on this subject, it seems as though he ultimately failed to translate the design into a finished print for some reason. 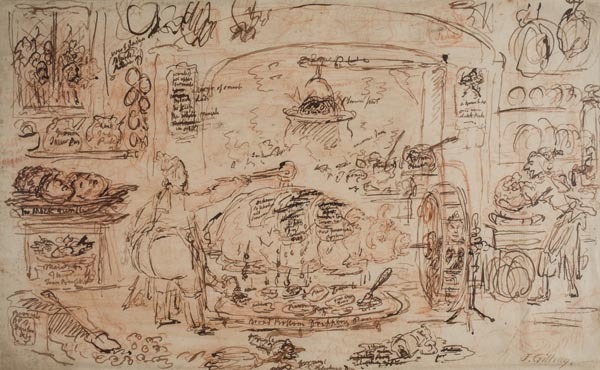 The drawing shown here was formerly the property of the American cartoonist and Gillray historian Draper Hill (1935 – 2009) and will be offered up for auction here in England in a couple of weeks time. The other two sketched versions of this caricature can be found in the Courtauld Institute and the New York Public Library. The latter version has the line John Bull Roasted hastily scrawled across it and this is assumed to have been Gillray’s working title for the design. So why did Gillray produce three versions of the same image? Ordinarily this could perhaps be explained by variations between the different drawings which would suggest that he was trying out different ideas as he worked towards a composition that he was happy with. However, apart from the fact that the Courtauld’s version is a mirror image of the other two and is drawn almost entirely in chalk, there does not appear to be a great deal of difference between the three sketches of the design. Nor can this be an image which Gillray kept returning to over a number of years, as the caricature relates to the short-lived ‘Ministry of All the Talents’ and therefore all three drawings must have been completed during their time in office between February 1806 and March 1807. Perhaps the presence of Gillray’s signature on this version and the Courtauld’s copy indicate that they were sold or given away to collectors shortly after they were drawn, thus requiring him to re-draw the design when the idea of engraving it resurfaced some weeks or months later? Whatever the explanation it is clear that Gillray couldn’t quite make up his mind about this caricature and went through the process of repeatedly working it up before finally abandoning the project once the Ministry of All the Talents left office in March 1807. The handwritten notes on the New York Public Library’s version of this drawing indicate that the image was conceived as a satire on the ‘New Plan of Finance’ announced in Parliament by Lord Henry Petty, the Chancellor of the Exchequer, on 29th January 1807. The plan essentially called for a massive unfunded increase in public debt which would be used to meet the immediate costs of continuing the war against France and her European allies. The public was promised that taxes would remain at their current level for the next three years, but opponents of the plan rightly warned that the proposed levels of borrowing would require swingeing tax rises to service the national debt once this period of grace had expired. Gillray shows the Prime Minister Lord Grenville as a cook basting John Bull with loans. The flanks of the roasting beef are covered in indistinct labels, one of which reads ‘New Loans’, whilst the juices from the meat drop into the ‘Broad Bottomed Dripping Tray’ which has been placed beneath the carcass on the floor. Lord Henry Petty is depicted as a ‘spit dog’ running in a wheel which turns the spit to which John Bull’s carcass has been fastened. Sidmouth, Lord Privy Seal in the Talents administration, stands on the far right of the images washing dishes in a sink, possibly intended as a visual pun on the new sinking fund that his government was planning to introduce. The caricature may have been intended to serve as a sequel to John Bull and the sinking-fund-a Pretty scheme for reducing the Taxes & Paying-off the National Debt! , Gillray’s other caricature on the New Plan of Finance, which was published by Hannah Humphrey on 23rd February 1807. However the Ministry of All the Talents was dismissed from office a month later and the New Plan of Finance was immediately shelved by their successors, thus rendering further satires on the subject irrelevant. The image was initially sketched in red chalk and then outlined in ink. The paper carries an 1805 watermark for the company of Ruse & Turners Upper Tovil Mill in Maidstone, Kent. It is estimated to fetch somewhere between £3,000 and £5,000.